Today marks the beginning of a new workshop and a new adventure in Laos. 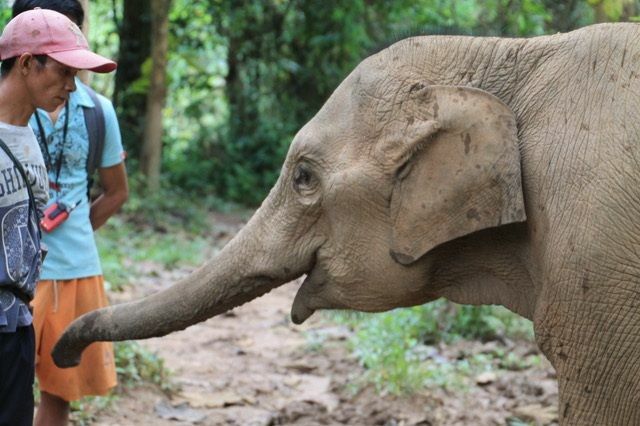 For the past three days we have been at Mandalao Elephant camp, just outside Luang Prabang. For me this was my second visit and I was very eager to see the progress that Michael Vogler has made with his elephants. In particular I couldn’t wait to see the young bull elephant Kit, because when I was there last time, this young elephant was quite aggressive and understandably Michael was nervous around him. Michael had never really learned the mechanisms of training, but was as enthusiastic as any student that I have had. Last year we sowed the beginnings of a new set of behaviours for Kit, as well as for Michael and his mahouts. Kit is now completely different and emerges from the jungle to see him and begin training each time with apparent enthusiasm. We helped Michael with some finer details of training, for example not allowing Kip to follow or copy Michael’s legs but to wait for clear voice cues, so as to remove the confusion that human locomotion induces when it becomes a signal to an animal. But actually the hardest part of the journey of training had already been achieved. Above all, the most outstanding thing I noticed was Michael’s clear and calm control and the solid relationship with his elephant. There was an unmistakable serenity surrounding both of them this time. Knowledge is certainly a key factor in giving people confidence and reducing uncertainty. The bond between these two was really evident for everyone to see. With the other older elephants who are in their 40s and 50s, we had a few training challenges to meet and we made very good steady progress. These older female elephants have quite a troubled background in logging and abuse and miscommunication along with confusion and I expect that the increased cortisol over the years has eroded some of their learning capacities, so while continued progress is to be expected, it also will be quite slow. The advantage of positive reinforcement in these situations is that it provides a new set of learning pathways that have not, by and large been tampered with before, so while progress is certain, it will be a little slow. It is important for us to be a part of this positive environment for the asian elephant and to continue to keep coming back to Mandalao to assist with their progress and training methods. Michael Volger has applied for a concession on a piece of land in the national park and his aim is to release Kit back into the wild. This would be amazing and maybe for the first time that it’s been done. Generally speaking the elephants at Mandalao are really placid and calm. They lack a little bit though in the sort of behaviours that make the vet’s life a little easier. They are sensitive animals and often don’t like being touched on their feet but they can get long nails which need to be filed. So it’s important for them to be able to put their feet on stumps and keep them there. (a little like a horse with a farrier) There are no means of restraint at Mandalao (no crush) the vet work all has to be done with the elephant being controlled by the mahout so this is yet another reason why our work is important here.